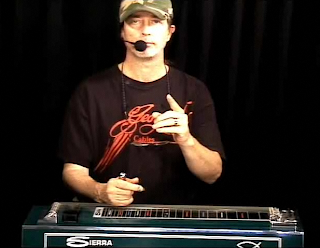 Joe Wright is universally recognized as one of the hottest pedal steel players in the world. He has headliner status when he performs at steel guitar shows, his blazingly fast right hand technique is legendary, and he has published many courses and video tutorials to help advance the art of playing pedal steel. For a couple of years now, Joe has been giving one-on-one video lessons via the Skype internet service. You can read about how these lessons work at skype.pedalsteel.com. To help you get started, Joe is offering an introductory lesson in exchange for a $10.00 donation to the Steel Guitar Forum. To take him up on the offer, click the PayPal Donate button below. I'll forward your email address to Joe, and he'll contact you to schedule the lesson. Your $10.00 donation will help pay the monthly internet bill at SteelGuitarForum.com, and you'll get a session with the steel guitar world's most famous personal trainer. Act now - this offer won't last forever. I'm trying to contact Joe Wright through his website but his "Contact Us" link doesn't work. Does anybody know what the email address is? If so, please send to me at alanmcca@yahoo.com.